The moon will appear to eclipse the bright star Aldebaran on Friday, Sept. 4, 2015, in what astronomers call an occultation. Aldebaran is a bright star that forms the eye of the constellation Taurus, the Bull. If you live in the eastern-third of the United States or southeast Canada and your local skies are clear on tonight (Sept. 4), take a good close look at the rising moon, which has a celestial date with a star this evening. The moon will appear 52-percent illuminated and be just hours before it reaches last quarter phase. If the bright star Aldebaran isn't right next to the moon, it may be directly behind the lunar disk and about to pop back out. In a sense this can be called an "eclipse" of Aldebaran by the moon, although the proper term for this celestial event is an "occultation." Orange Aldebaran marks the angry eye of the constellation Taurus, the Bull and is the brightest star that the moon can occult (other than the sun, of course!). Its abrupt disappearance or later, its reappearance (at the moon's dark side) can even be seen with the unaided eye; the famed Polish astronomer Copernicus witnessed just such an event in the year 1497, as did Japanese astronomers in 640 A.D. But the moon's bright gibbous phase and low altitude at this impending event argue strongly for using binoculars or a telescope, if possible. This is especially true for the disappearance which will take place along the moon's bright limb. Take note that in many cases the altitude of the moon is less than 10 degrees; your clenched fist held at arm's length measures 10 degrees. Obviously, if you intend to observe this occultation it is imperative that your view toward the east-northeast horizon does not have any tall obstructions such as buildings or trees, or else you will not be able to see the rising moon. The best views will be over an open body of water (a sea horizon) which will be flat and free of any obstructions. When Aldebaran reappeared from a similar occultation in 1978, astronomers at Iowa State University used high-speed photometry to confirm that this star has an apparent angular diameter of 0.02 arc second. That's 90,000 times smaller than the average apparent size of the moon, or put another way, the size of a penny in Philadelphia if it could be viewed from as far away as Washington, D.C. As small as that it, it is actually much larger than most other stars subtend, so Aldebaran always takes at least 1/30th of a second to fade or brighten at a lunar occultation. Under special conditions, as when it grazes the lunar limb or encounters a lunar mountain or valley at just the right slope, the process can be more drawn out – enough so as to appear gradual even visually in a telescope. This occultation is the first of a series of Aldebaran occultations accessible to U.S. observers that will continue each month for the next 27 months. But since a particular occultation is visible for only a fraction of the Earth's surface the actual number that will be visible from your hometown will number far less. 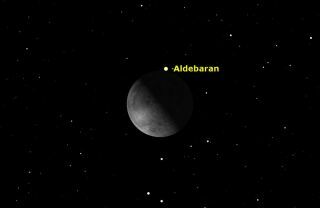 Generally speaking from now until the end of 2017, most locations will be treated to about 8 to 10 "Aldebaran eclipses." Friday's favor the Eastern U.S. and southeast Canada. The next favorable one on Thursday morning, November 26th (Thanksgiving Day in the U.S.), will be visible from Alaska, all of Canada and the northern half of the contiguous (48) U.S.
Because Aldebaran lies 5 degrees south of the ecliptic in the constellation Taurus, the moon's path across the sky carries it that far south only when the ascending node of the lunar orbit lies in Virgo, Leo or Cancer. The node is slowly regressing along the ecliptic in its 18.6-year cycle and the current series of Aldebaran occultations began on Jan. 29 of this year over the Arctic regions. The very last of the current series will be on Sept. 3, 2018 over Greenland and the Arctic regions. This chart lists the times of occultation for Aldebaran, as the moon blocks the bright star, as seen from several major cities across North American on Sept. 4 and 5, 2015. Editor's note: If you capture an amazing photo of the moon and the bright star Aldebaran, or any other night sky view, and you'd like to share it with Space.com, send images and comments in to managing editor Tariq Malik and the team at: spacephotos@space.com.